Wikimaps is using a customised version of the Mapwarper open source map georectification software as seen on http://mapwarper.net to speak with the Commons infrastructure and running on Wikimedia Foundations Labs servers. 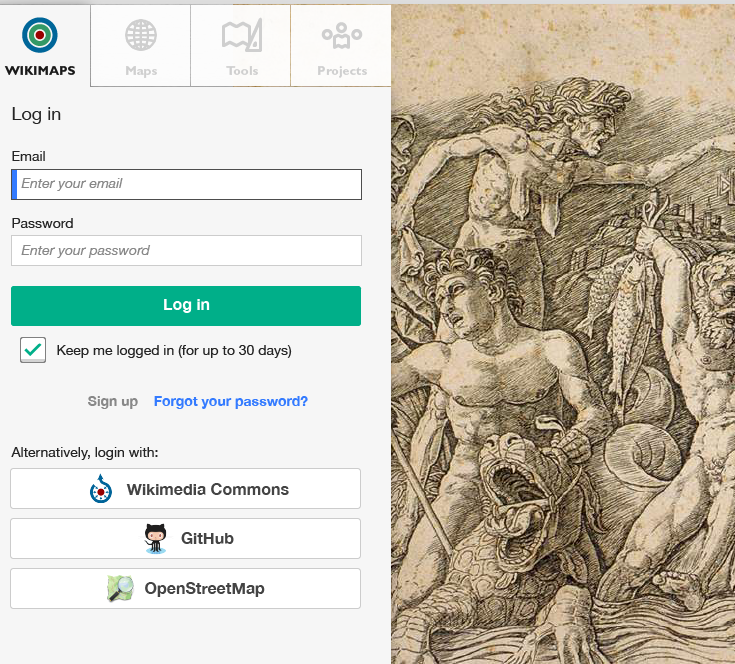 We needed a way to allow Commons users to log in easily. And so I developed the OmniAuth-MediaWiki strategy gem so your Ruby applications can authenticate on Wikimedia wikis, like Wikipedia.org and Wikimedia Commons. 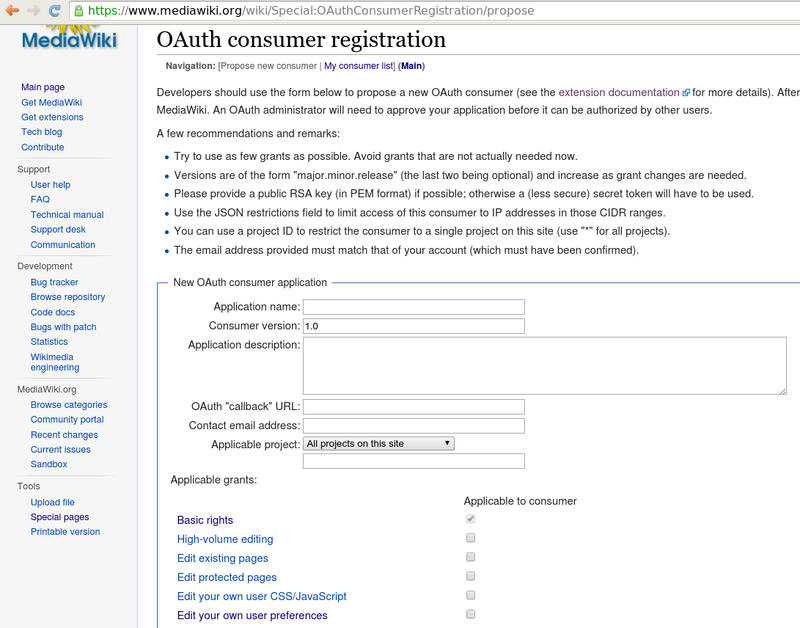 The mediawiki.org registration page is where you would create an OAuth consumer registration for your application. You can specify all Wikimedia wikis or a specific one to work with. Registrations will create a key and secret which will work with your user so you can start developing straight away although currently a wiki admin has to approve each registration before other wiki users can use it. Hopefully they will change this as more applications move away from HTTP Basic to more secure authentication and authorization strategies in the future! If you would like to use this plugin against a wiki you should pass this you can use the environment variable WIKI_AUTH_SITE to set the server to connect to. Alternatively you can pass the site as a client_option to the OmniAuth config as seen above. If no site is specified the www.mediawiki.org wiki will be used. This is different from many other OAuth authentication providers which allow the consumer applications to specify what the callback should be. Here we have to define the URL when we register the application. It’s not possible to alter the URL after the registration has been made. Internally the strategy library has to use `/w/index.php?title=` paths in a few places, like so: :authorize_path => '/wiki/Special:Oauth/authorize', :access_token_path => '/w/index.php?title=Special:OAuth/token', :request_token_path => '/w/index.php?title=Special:OAuth/initiate', This could be due to a bug in the OAuth extension, or due to how the wiki redirects from /wiki/Special pages to /w/index.php pages….. I suspect this may change in the future. Another thing to note is that the mediawiki OAuth implementation uses a cool but non standard way of identifying the user. OmniAuth and Devise needs a way to get the identity of the user. Calling '/w/index.php?title=Special:OAuth/identify' it returns a JSON Web Token (JWT). The JWT is signed using the OAuth secret and so the library decodes that and gets the user information. OmniAuth is mainly about authentication – it’s not really about using OAuth to do things on their behalf – but it’s relatively easy to do so if you want to do that. They recommend using it in conjunction with other libraries, for example, if you are using OmniAuth-twitter, you should use the Twitter gem to use the OAuth authentication variables to post tweets. There is no such gem for MediaWiki which uses OAuth. Existing Ruby libraries such as MediaWiki Gateway and MediaWIki Ruby API currently only use usernames and passwords – but they should be looked at for help in crafting the necessary requests though. So we will have to use the OAuth library and call the MediaWiki API directly: In this example we’ll call the Wikimedia Commons API Within a Devise / OmniAuth setup, in the callback method, you can directly get an OAuth::AccessToken via request.env["omniauth.auth"]["extra"]["access_token"] or you can get the token and secret from request.env["omniauth.auth"]["credentials"]["token"] and request.env["omniauth.auth"]["credentials"]["secret"] Assuming the authentication token and secret are stored in the user model, the following could be used to query the mediawiki API at a later date. Here we called the Query action for userinfo asking for rights and editcount infomation. This entry was posted in Wikimaps Warper and tagged devise, mapwarper, mediawiki, omniauth, ruby, wikimaps, wikimedia on 3 September 2014 by timwaters.